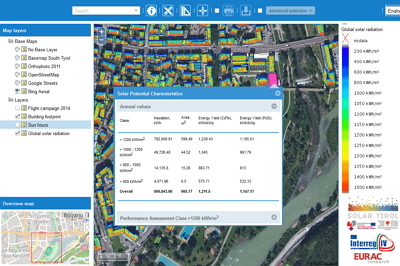 PV-initiative WebGIS shows the surfaces potentially available for installing solar modules. The annual availability of the solar resource on the different roofs has been titleed into 4 intervals: <800, 800-1000, 1000-1200 and >1200 kWh/m² and it is showed by means of different colors none, yellow, orange and red respectively. Moreover, you can obtain specific information regarding the irradiance and photovoltaic potential just by clicking directly on the roof of the building. iMONITRAF is objectives are to develop common strategies for transalpine traffic and to put them into action. A long-lasting political network shall be established, which serves as common voice of the Alpine regions and which is recognised on regional, national and EU level. It pushes innovative measures for more sustainable regional development. iMONITRAF! will develop a broad political network to find common strategies. 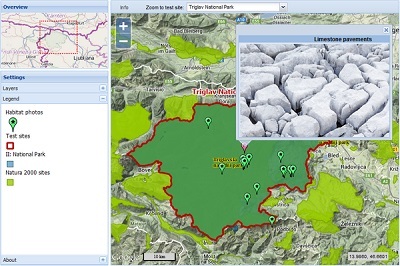 HABIT-CHANGE: This is a WebGIS platform developed by EURAC, with data provided by the HABIT-CHANGE project, to visualise protected areas and the Natura 2000 network in Central Europe as well as sensitivity maps and climate scenario data calculated for the HABIT-CHANGE test-sites. 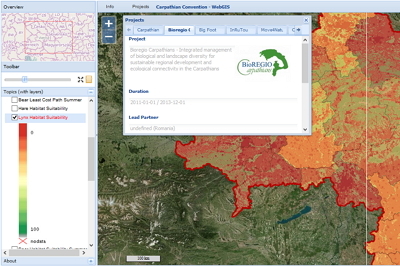 Project BioREGIO Carpathians is an EU project, whose aim is to show how an integrated management of the Carpathians’ natural assets can boost both sustainable development and ecological connectivity in the Carpathian region. Particularly the project seeks to identify the most probable habitat and core areas as well as ecological corridors for each species to move through the landscape. Project LIFE+ Making Good Natura - Making public Good provision the core business of Natura 2000 - project number LIFE11 ENV/IT/000168 - is a LIFE+ project with a length of four years (2012 -2016), inserted into the LIFE+ Environment Policy and Governance component, co-financing innovative or pilot projects that contribute to the implementation of European environmental policy. The project "Kommunale Lichtpläne" cares about saving energy in the field of illumination in urban environments. This project is collaboration with the EURAC institut for Public Management, the public agency of environmental for energy saving, and the municipalities in Passeiertal Moos, St. Leonhard and St. Martin, Riffian, Kuens and the municipality of Schenna. 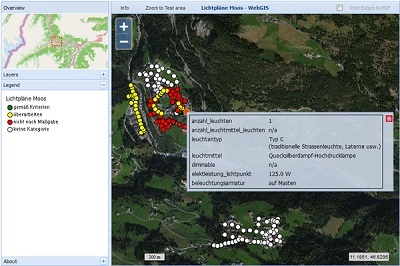 The WebGIS shows the illumination including information about the light quality, the quantity of polution and a classification about conservation of energy. 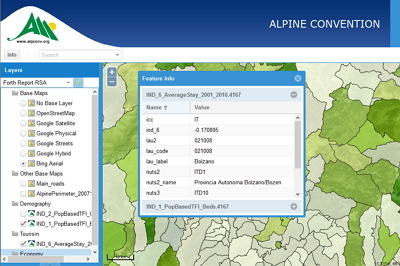 The project HiResAlp deals with the development of an Innovative Framework for the Integration of Multi-Source Data to Determine Soil Moisture and Evapotraspiration at High Resolution in Alpine Region. SnowAlps: In this WebGIS, snow cover maps at 250 m resolution from MODIS sensors on board of TERRA and AQUA satellites are provided. The snow maps are available in daily format. 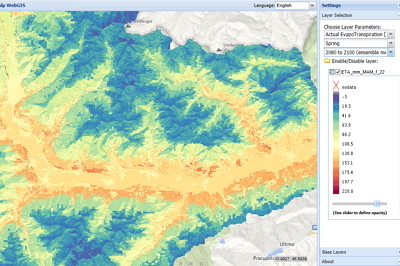 Moreover, snow cover duration maps from year 2002 to 2012 are also available. The Alpine Convention: The Alpine Convention is an international treaty between the Alpine countries (Austria, France, Germany, Italy, Liechtenstein, Monaco, Slovenia and Switzerland) as well as the EU, aimed at promoting sustainable development in the Alpine area and at protecting the interests of the people living within it. It embraces the environmental, social, economic and cultural dimensions. SolarTirol: The aim of SolarTirol project is to create a freely accessible, geo-referenced solar potential data base, which will allow private users and public bodies to estimate the solar potential on a roof level, and to give concrete recommendations to public authorities and politicians about the relevance of solar energy and the potential to further develop solar energy in Tyrol and the Province of Bolzano. Carpathian Convention Geoportal: The goal of the Carpathian Convention Information System (CCIS) is to collect, manage and disseminate transnational geographic data sets for the Carpathian region by linking existing information systems and projects. Vulnerability assessment in Burundi :The aim of the vulnerability assessments in Burundi is to identify those regions most susceptible to climate change effects. Focusing on soil and water resources, the assessment provides scientific input for the selection of “climate change hotspots” in Burundi and the development of appropriate adaptation measures on the national and local level, which are used by a GIZ climate change adaptation project. 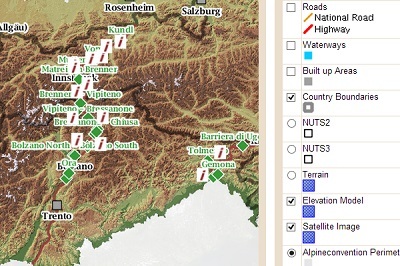 The aim of SolarTirol project is to create a freely accessible, geo-referenced solar potential data base, which will allow private users and public bodies to estimate the solar potential on a roof level, and to give concrete recommendations to public authorities and politicians about the relevance of solar energy and the potential to further develop solar energy in Tyrol and the Province of Bolzano. 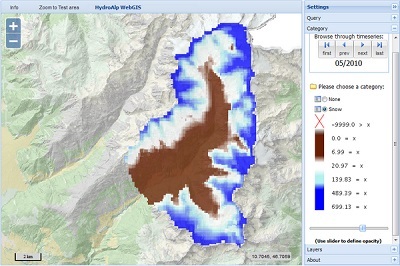 In this WebGIS, snow cover maps at 250 m resolution from MODIS sensors on board of TERRA and AQUA satellites are provided. The snow maps are available in daily format. 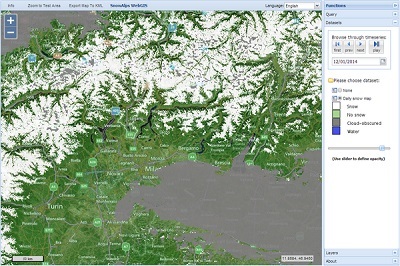 Moreover, snow cover duration maps from year 2002 to 2012 are also available. The Alpine Convention is an international treaty between the Alpine countries (Austria, France, Germany, Italy, Liechtenstein, Monaco, Slovenia and Switzerland) as well as the EU, aimed at promoting sustainable development in the Alpine area and at protecting the interests of the people living within it. It embraces the environmental, social, economic and cultural dimensions. 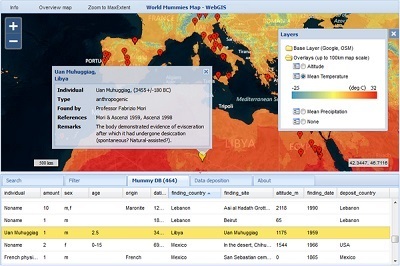 The Mummy Map WebGIS platform aims to visualize all known sites where mummified human remains have been found around the world and provides background information to these findings. 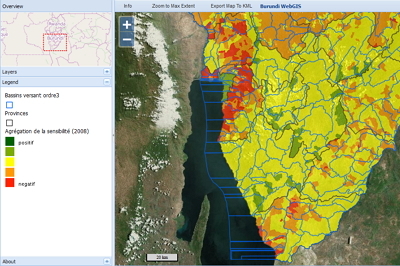 By applying various search algorithms the data can be filtered and selectively displayed on the map. In addition it will be possible to overlay the finding sites with climate maps displaying the mean temperature and precipitation of the last twenty years. 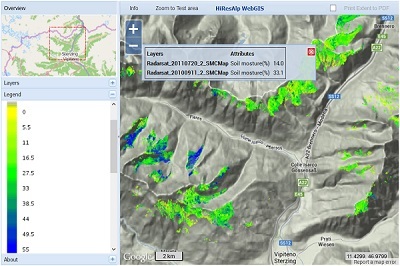 This is a WebGIS platform developed by EURAC, with data provided by the HABIT-CHANGE project, to visualise protected areas and the Natura 2000 network in Central Europe as well as sensitivity maps and climate scenario data calculated for the HABIT-CHANGE test-sites. The project BioREGIO Carpathians is an EU project, whose aim is to show how an integrated management of the Carpathians’ natural assets can boost both sustainable development and ecological connectivity in the Carpathian region. Particularly the project seeks to identify the most probable habitat and core areas as well as ecological corridors for each species to move through the landscape. The project LIFE+ Making Good Natura - Making public Good provision the core business of Natura 2000 - project number LIFE11 ENV/IT/000168 - is a LIFE+ project with a length of four years (2012 -2016), inserted into the LIFE+ Environment Policy and Governance component, co-financing innovative or pilot projects that contribute to the implementation of European environmental policy. 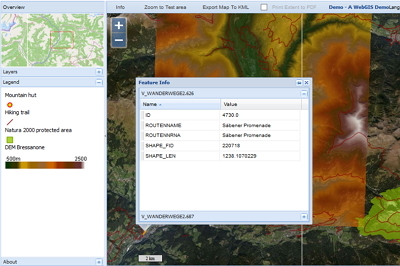 WebGIS shows the surfaces potentially available for installing solar modules. The annual availability of the solar resource on the different roofs has been titleed into 4 intervals: <800, 800-1000, 1000-1200 and >1200 kWh/m² and it is showed by means of different colors none, yellow, orange and red respectively. 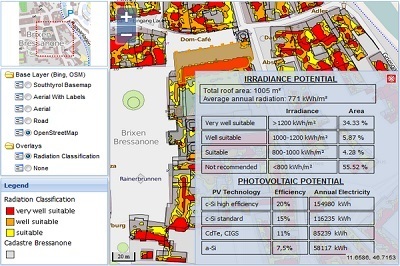 Moreover, you can obtain specific information regarding the irradiance and photovoltaic potential just by clicking directly on the roof of the building. iMONITRAF!s objectives are to develop common strategies for transalpine traffic and to put them into action. A long-lasting political network shall be established, which serves as common voice of the Alpine regions and which is recognised on regional, national and EU level. It pushes innovative measures for more sustainable regional development. iMONITRAF! will develop a broad political network to find common strategies. 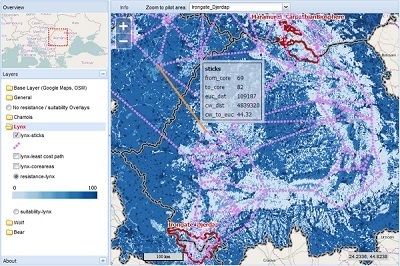 The goal of the Carpathian Convention Information System (CCIS) is to collect, manage and disseminate transnational geographic data sets for the Carpathian region by linking existing information systems and projects. The aim of the vulnerability assessment in Burundi is to identify those regions most susceptible to climate change effects. Focusing on soil and water resources, the assessment provides scientific input for the selection of “climate change hotspots” in Burundi and the development of appropriate adaptation measures on the national and local level, which are used by a GIZ climate change adaptation project. 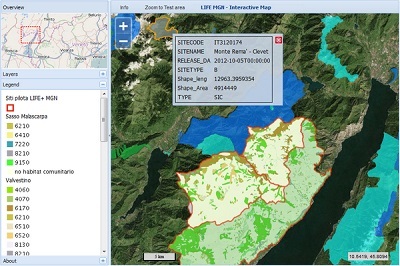 Demo project presents a simple WebGIS application that can be used as a template for further development.